The Shoe Lady is the expert at finding hard to find sizes and helping find your best size for the length, width and shape of your feet. Now you don’t need a Fairy Godmother to get a shoe that fits! What Shoes for A Size 10.5M With Short Toes? I have always had big feet. I passed my grandmother’s size 7 at an early age and flew by my mother’s size 9 in fourth grade. Finding shoes growing up was always a problem because anything my mother could find in my size she felt looked way too “grown up” for me. By the time I reached junior high I had hit size 10, and they very difficult to locate in our area. Many times I would walk into a store to ask if they had anything in my size and was turned away because they had nothing. I have lost count of the times I actually found a pair only to try them on and find out they didn’t fit and of the many looks on the faces of salesclerks and even rude comments when I declared they were too small. As hard as it was to find shoes there was still a part of me that would get excited when I finally found a size 10, fleetingly hoping it would actually fit, an inner sigh of disappointment when they did not. It has grown much easier to find size 10, 11 and even larger in my area, but never a half size. I still try on tons of shoes to find a 10 that runs big or an 11 that runs small. When I do find something I hang on to it and take care of them, wearing them as long as possible and sometimes even buy additional pairs. It seems I have short toes (or at least the ball of my foot is always closer to the toe than where the ball of the shoe lies) along with an unusual size of 10.5 which makes it very difficult to find the right fit. Would you have any recommendations on shoes for me? the 10.5M shoe size problem is not so hard. Today DesignerShoes.com has 752 women’s shoe styles available in size 10.5. But, alas, the short toes are more of a challenge. Shoes are actually designed and sized based on the distance between the ball of the foot and the heel. So if you have short toes and you buy your shoes by toe to heel length, the outward curve of the shoe where the ball of your foot should be will always hit your foot in the wrong spot, making the shoe feel strange. Your best bet for this is to look for styles that don’t taper in too much at the toe box. Look for a rounder or square toe box shape. How Do You Make Your Own Shoes? I was wondering if you do any tutoring on show making? Or know anyone who does? Since I’m trying to make a mean forme for my shoe. I thought about your question on how to make shoes a lot. So much that I thought I’d responded. I don’t do this tutoring. Nor, I believe, does DesignerShoes.com. HOWEVER! There are some very useful videos on YouTube. Do a search for “how to make shoes” or ‘how to make a last for shoes”. Take a look at the choices. Please do report back and let us know your favorite videos on this topic! Anyone else have suggestions on where to learn how to make your own shoes? Labor Day weekend is here and it is a perfect time to discover your foot type. Why now? The Shoe Lady most fervently hopes and recommends that you will be spending a significant portion of the weekend under sunny skies, near water and barefoot. Get your bare feet wet. Now step on dry pavement. Which of the shapes below look most like your footprint? Why does it matter? There are 28 different “fit points” involved in building a pair of shoes. Length and width are only two of those 28. Understanding your foot’s shape will help you make better choices about the style of shoes to buy. SHAPE A and B: High arches. Shape A has such high arches that the foot is raised off the ground even at the outside edge. Shape B has high arches with a narrow outer edge of the foot touching the ground. About 20% of the population have high arches. This type of foot tends to be a bit more rigid than other types. Imagine carrying your body weight on your heels and the balls of your feet with a delicate bridge of tiny bones, tendons and muscles holding the foot together in mid air. Are you feeling sorry for your feet? You should be! Treat them well. Think about that delicate bridge and do what you can to support it. Many shoes come with arch supports built in. The Propet brand includes removable arch supports in all it’s styles. Many other brands like Naturalizer, Ros Hommerson and Soft Spots include some styles with removable arch supports. The problem with arch supports is making sure that it fits the shape of the arch in your foot. Once you figure out how to support that arch, you will have a relatively wide selection of styles. If you need an arch support or orthotic all the time, you may be limited to styles that are closed and styles that can accommodate an orthotic insert. While you are imagining your foot centered around a delicate bridge linking the ball and the heel, don’t forget to feel sorry for the ball and heel – left to carry the full weight of whatever you may be. Unless you are elfin thin, this can be hard work for the ball and heel of your foot. Think soft cushioning for them. Think about keeping them flat so they can share the burden of your weight. When you wear heels, more responsibility for carrying your weight goes to your toes and the balls of your feet. Ballet flats are a great choice. Even better if the inner or outer sole add cushioning. SHAPE C: Average arches. Shape C is what shoe makers assume when they design a new shoe style. There is an arch, but not high. Pay attention to other aspects of your foot shape. But you are “home free” on the arch issue when it comes to picking styles! One of the most annoying problems with buying shoes for flat feet is finding shoes that do not gap around the area of the arch. The best choices for flat feet are shoes with a high vamp and shoes with a mary jane style strap across the top of the foot. You will find many “granny” styles that fit this description. Keep in mind, dear young one, that your sense of style can convert that granny look to something hot with the right accessories. Think red mary jane’s and purple paisley knee socks. It doesn’t have to be dull. High vamp shoes also bring the two sides of the shoe together more and so will avoid the gapping problem with your shoes. A loafer is a typical high vamp shoe. Some other flats and pumps have higher vamps as part of their design. There are more straps, inserts, etc. A new “retro” style this season is the “smoker” flat. it has a high vamp. And, of course, lace ups and ankle boots are always good to close that gap. 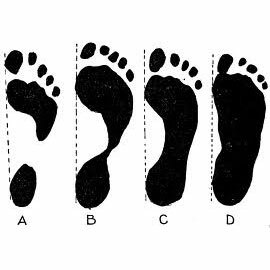 Use these images to determine your foot type. Footnote on arches: There are two main arches in our feet. The long arch runs from the ball of the foot to the heel. The transversal arch runs under the ball of the foot. For more information, see this Wikipedia article. I have narrow feet (size 7.5) and a longer big toe. Also, as I have very thin skin, I need a lot of extra cushioning for the ball of my feet. I find it virtually impossible to buy comfortable high heeled office pumps. Any suggestion to brands I may try or getting custom made shoes? You were born with narrow feet, toes of disproportionate length and thin skin so the nerve endings are near the surface and very sensitive. Mother Nature is trying to tell you something! Why oh WHY are you trying to find high heel office pumps!?! Good grief. The challenges The Shoe Lady must rise to. First, re-think the high heel part of the shoes you are seeking. I’m sure you can find a way to look like an executive, leader, office diva without high heels. But The Shoe Lady is here to help. I will provide you with some “tips” that may shed light on a solution. First, fit for your longer big toes. I generally ask people to measure their feet from heel to toe. And it works fine unless the toes are shorter or longer than average. Truth is, shoes are made assuming a standard toe width and the key measure is the length from your heel to the widest part of your foot, the ball of your foot. You should measure your feet on a Brannock device. This will tell you your shoe size if your longer toes were not an issue. Why is this important? If you are buying size 7.5 shoes because of your longer toes, but your heel-to-ball size is really a 6.5, then the shape of the shoe will not accommodate the ball of your foot correctly. The ball of your foot will hit a narrower part of the shoe and in high heel pumps, this will be painful, even for thicker skinned folks. Once you know the Brannock size and the full foot size, you will need to learn about shoe last shapes. You will need a shoe shape that does not have a pronounced inward curve at the arch and outward curve for the ball of the foot. An extreme example to consider might be a “D’Orsay” style pump. Second, high heels. If you are going to insist on high heels, let’s determine how high. Studies of foot biomechanics suggest that women should not exceed heels of about 2.5 inches if they are going to wear them for most of the day. But I hear you say you want to wear a 3 inch heel. Then look for a pump that has a half inch platform sole. You can have the heel if you raise the front of the shoe too. What? You want a 4 inch heel with no platform? OK. Here’s the deal. Wear a reasonable 1-2 inch comfortable heel to work, on the way home, going to get lunch, etc. Slip into the 4 inch heel while you are at your desk and walking to and from meetings. Do not stand or walk in them for more than two hours a day. Third, finding comfort. There are a couple of options on the market that you may want to try. Cole-Haan, part of the Nike shoe family, has used Nike’s technology for adding gas filled pillows under the balls of the feet. You could find such pillows at a big drug store, but these are more permanent. Look into the Insolia (http://insolia.com/) product to see if this will help. Some shoe manufacturers incorporate it into their shoes. But you can buy the inserts and add them to your shoes. Fourth, staying healthy. Too much time in high heels will change your natural walking gait, even when you walk in flats or barefoot. And it isn’t a good change. It effects your posture, your ankle movement, your foot flexibility and the calves and tendons in your lower legs. Of course all of this also effects your hip joints and back. But I’m going to assume you are under 30 and don’t care about that. If you do wear high heels a lot, then daily you must stretch out the backs of your legs, the tendons. You must do foot exercises to keep those 27 bones, and all their related tendons and muscles, in each foot lively and moving. Pick things up with your toes. Role your feet over a golf ball. Note. If you are over 30, all that nice padding under the balls of your feet has started to slide forward toward your toes, or just disappear. This means it is “bone on ground” time. And the higher the heel, the more weight on the ball of your foot! Fifth, brands to try. Cole Haan, but they may not carry narrows. Naturalizer, has comfort features and platforms. Ros Hommerson, has been off market but is re-launching this Fall and I expect will bring good design and comfort features in narrow sizes. Other brands that offer great “career wear” styles in your size include Bella Vita, Sofft, Soft Spots, Soft Walk, Trotters. Try this link to get some options in your size: http://www.designershoes.com/all-products?collections=267&heel=51&p=2&sizewidth=140. There are at least two. This is not a good thing, as everyone assumes theirs is the “correct” and “standard” method, so customers are left to guess. Both methods begin by placing the shoe upright on a flat surface, standing a ruler up vertically alongside of it, and then measuring from the flat surface to where the heel is attached to the shoe (visible line on shoes with attached heels). One method places the ruler alongside the shoe at about the middle of the heel, the other places the ruler at the very back of the shoe (at the back seam of a pump). Obviously, the result will be different depending upon where the measurement is taken. I once thought height was measured from the middle of the heel at the side of the shoe as you describe, until I read that measuring from the back of the shoe is the standard, because that location is easier to find than the middle of the heel. And when I started shopping online, I found that most merchants also measure from the back. But I just received a pair described as having 10cm heels, and found they are “actually” 12cm (as measured from the back). So I started some research, and found not only your article, but that so large a vender as Zappos also measures from the middle of the heel. Things become more complicated with platform shoes. Most venders state total heel height and platform height as separate numbers, and allow their customers to do the arithmetic and figure out the foot angle. Apparently you publish effective heel height ( = total heel height – platform height)? Actually, it’s all definitions when you come right down to it. And it is becoming obvious that there is no single universally agreed-upon standard in the industry. I think venders need to link explanations of how they reckon heel height to their order pages so their customers will see them. This will save frustration for people like me, and for Vanessa of Tennessee! Where have you been all my life Soul Sister! You are so right about the vagaries of measurement. Everyone has a slightly different “standard” for measuring and it can result in some significant differences in heel heights. As for platform shoes, DesignerShoes.com lists the heel height, not the “effective” heel height. But I will tell them, they should make that more clear! Thanks for your excellent comments. And your appreciation of Will Rogers! TSL: Where have you been all my life Soul Sister! TSL: You are so right about the vagaries of measurement. Everyone has a slightly different “standard” for measuring and it can result in some significant differences in heel heights. And significant confusion when shopping for shoes, and coordinating an outfit for the correct height. TSL: As for platform shoes, DesignerShoes.com lists the heel height, not the “effective” heel height. But I will tell them, they should make that more clear! Thank you. I took only a quick glance at DesignerShoes.com, but I will have to spend some time browsing. My feet are size 9, and just a bit wide. Finding the fun and unusual styles at prices I can afford is enough of a challenge already without having to worry about whether they will pinch my toes into aching numbness! TSL: Thanks for your excellent comments. And your appreciation of Will Rogers! Here is a photo of my “10cm” heels that turned out to be 12cm (measured at the back of the shoe). They are made in Italy, and came to me by way of a little shop in Germany. I was planing to send this photo to them, to ask how they measure the heel heights they list on their website. Ordering from Europe can be something of a challenge, but they have such beautiful and elegant styles there (made in Italy and Spain, mostly), expertly crafted from best quality leathers and offered at ridiculously inexpensive prices for what they are. When I find a great pair, I want to keep them forever, and synthetics do not last that long. And they never really take the shape of my feet the way leather does. Will the Width Change if She Gets a Half Size Smaller? I recently purchased Bella Vita Mimosa Black Snake in a 9.5 extra wide and found that the shoe is a little long and I have extra room in the heel and toe. I’m thinking of exchanging it for a 9 extra wide. However, the 9.5 extra wide fits me nicely width-wise and if the width changes, the shoe won’t fit. So, my question is, is there a difference width-wise between a 9.5 ww and a 9 ww?? Thanks in advance for your assistance!! In THEORY: There is some general agreement that a shoe increases 3/16th of an inch around the circumference of the ball of the foot for every increase in width for the same length. But different manufacturers accomplish the extra width differently. Some may cut more material for the upper part of the shoe. Some may cut the sole slightly wider. Some may only increase the width for every full size length change – or even every couple of size length changes. You never can be sure as the manufacturing processes can differ even for the same style. Since we don’t know, and probably the folks at Bella Vita don’t know, what the decision was for changing the width dimensions on this particular style, the only way to know is to try the smaller size and see if that squeezes your foot more than you would like. 3/16ths of an inch is not a big difference. If the length really is uncomfortable for you, it may be worth trying the shorter version and having it stretched by a professional shoe repair shop if it is too tight. If it is just a tad too long, you risk changing the contour of the shoe, where the wider part hits your foot, which could make the width feel different. Sorry Allie, no right answer here. The choice is yours! Tight Toes. Loose Heels. What to Do? I bought a pair of designer shoes that fit at the time, but last time I wore them the toes were very tight and the heels were slipping off. The shoes are black patent leather so the at-home remedy of socks and a blow dryer make me nervous! Also, I would like to wear a gel insert for under the ball of my foot, but since the shoes are tight at the toes, will the insert be useless? What do you suggest? My first reaction is to figure out the root cause of this weird development. The shoes fit, then they became too tight in the front and too loose in the back? My guesses: weather changes? some gremlin switched the shoes? shift in subcutaneous tissues from your heels to your forefeet? Let’s forget root cause and go to cure. The cure for this is a visit to a GOOD, EXPERIENCED shoe repair shop. Warning, these are an endangered species and need all our support. For example, whenever we buy new shoes, we should take them to a good shoe repair shop and have small taps put on the outside of the heels, where you might tend to wear down the heel, and on the toe. For you, for this situation, you will want to show the shoe repair person how the shoe fits on your foot and see if she/he can stretch it in just the right places, and just the right amount of stretch to get it comfortable again. They have the tools. Also, while you are there, see if they can suggest something to tighten the heel. This might be possible if it is a slingback. However, if it is a closed heel pump, I don’t expect much success from adding those pads that stick to the inside back of the heel. The best luck is to push your foot back into the heel, and gel pads in front might just do the trick. For your peace of mind…. or what’s left of it after the frazzle of planning a wedding…. you will need to have the shoes on your feet when you try on the dress. You can not rely on what you read on line. Most wedding shoe manufacturers, the ones that are really devoted to that business and don’t do other styles, know how critically important the exact heel heights are. They measure them and make that information available. But Kate Spade makes a variety of different shoes and may not be paying attention to the importance of exact heel height in wedding shoes. But let’s say they are. Some websites may choose to round up to the nearest half inch. Some websites may measure the heels themselves. And here is where the real problem comes into play. There are three ways to measure the heel height, all give different, sometimes significantly different, results. 1. Traditionally, shoe manufacturers measured heel height from the breast of the heel. This is the part of the heel that faces forward. This is the shortest dimension and is no longer considered correct. 2. Some people measure the heel height by holding a tape measure to the back of the heel, where the heel meets the shoe’s sole, and consider the heel height to be the length of the heel. But this, too, is incorrect because often a high heel is designed to angle inward, thus making the heel measurement higher than it should be. This will give you the correct measurement for that shoe which is generally measured in an average size. But shoe manufacturers can vary on what they consider average. It should be size 9. But more likely it is size 7. Since the heel height is graded to stay in proportion to the overall design of the shoe, a woman who buys a shoe correctly measured, at 2.5 inches, but she buys it in size 11, is likely to find that the shoe is actually 2.75 inches. So… buy the shoes you want, hope for the best and prepare to add a pad in the heel if the shoe isn’t quite high enough. But, not to worry, the price for re-hemming is just one more cost of the wedding. Aren’t you glad you asked?!? 1. Take the higher of the two measures.2. Split the difference of the two measures. So sorry. But I can not even find an “arch length” reference on Google! I use a Brannock device and have never heard of anyone measuring the arch length. I suggest you not worry about arch length, worry about foot length and width. Then pick your style of footwear, shape, vamp design, etc., based on whether you have a high or flat arch. Also consider using orthodics for a better fit. I had done some more research since I contacted you and pretty much answered my question. Shoes are actually made for your arch length; Manufacturers simply count on everybody having regular sized toes. The arch length (heel to ball length) doesn’t concern most people (hence why I and almost everyone else hasn’t heard of it), because most people have arch lengths that correspond to their foot lengths (in other words, they have “normal” sized toes). There are some people, however, who have extra long or extra short toes. This makes the arch length and foot length very disproportionate (short toes correspond to a long arch length and long toes correspond to a short arch length). I have short toes in proportion to the size of my foot, so the length of my foot will fit well into a size 15 shoe, but the break of my foot is much higher up than the break of the shoe. This makes the shoe too tight on the ball and presses the toes together. The widest part of your foot us supposed to match up with the widest part of the shoe. This can cause big problems in the future and could be part of the reason why I have mild bunions on both feet. On the Brannock Device, the heel-to-ball measurement is on the opposite side of the width bar. The numbers correspond to the shoe size. When I measure the length of my arch on the Brannock Device, it goes off the chart. My arch length corresponds to between sizes 16.5 and 17. This is the size I’m supposed to wear, even though I will have extra room in the toe box. People with extra long toes have a special problem: If one’s arch length corresponds to a size 11 but their foot length corresponds to a size 13.5, they can’t simply go with a size 11. Their toes would be squished. These people either have to buy a pair of shoes that are too wide for the rest of their foot to accommodate for the ball, or they have to find a shoe that has a extra longer toe box. Hopefully that made sense lol. Thank you for the clarification. And the detailed description. I’d never heard this referred to as “arch length” before. But I am painfully familiar with the “ball to heel” length. You are absolutely right, this is the dimension that shoemanufacturers use. And they assume an average toe length. So people with short toes and people with long toes have to take that into consideration when they buy shoes on line. I tend to suggest that they think of the shape of their foot in relation to the shape of the shoe. But non-average toe length alone is often the culprit. Can “Gapping” be Controlled by Wearing Narrower Shoes? I require narrow width, as medium is full of gaps! My actual size is 12 1/2, which is already too large. Smaller sizes have choices of 1/2 sizes AND width! When a STYLISH or COLORED choice is advertised, it is immediately out of stock or backordered! Of course, we too want to purchase a variety of shoes. Please help us! There are a lot of causes for why your shoes gap. Don’t assume that your shoes are too long or too narrow. It could be that your toe length is not in the standard ratio of the “heel to ball” length. It could be that your feet are flatter than average or arches are higher than average. These are the most common reasons for gapping. You will need to come to a clearer understanding of the shape of your feet and how that shape differs from the average shape. Then you will need to pick styles that accommodate your foot shape. I suggest you look for styles in size 12N to start. Bella Vita, Softwalk and Trotters are good brands to consider. I could not agree more that it isn’t fair to offer shoes in size 5.5 which is 4 half sizes from the AVERAGE size 9, but nothing in size 12.5 which is also 4 half sizes from the average size. Support the companies that take on this battle! It isn’t easy. I’ve got the scars to prove it. How unfortunate for me that manufacturers are focusing on WW,WWW,WWWW . Many women with size 13 DO HAVE NARROW FEET and want to keep it that way! Mine used to be AAA but over the years they widened for lack of available size for me. How rediculous about “dainty feet” – Are you kidding??? And the 13 proportion is very often wrong and ugly on the foot. Seems they simplly make the front of the toe longer, which makes our feet look like gunboats! Casual flats too often are too long from instep to end of toe, rather than a low cut just covering the toes- a much more attractive and better proportioned shoe. Occasionally they get it right. I’m doing fine – just wish someone was giving it more consideration for the high prices we must pay! Women with large feet also loook for more shoes to but…Wed love to see our size 13N included in the “NEW” and WE HAVE YOUR SIZE” ads! And what about the newest colors? NOPE! What does exist I probably purchased a year or two or three ago… OH, well, That’s that.